Hi! I am Rob Galbraith, president of Keystone Architecture, and I was surprised with a very special Christmas present from my wife Carol in 2015. It was a Frank Lloyd Wright weekend in Wisconsin! I have been a great admirer of Frank Lloyd Wright over the years, and Carol and I have visited many of his famous projects including Taliesin and Taliesin West, Falling Water, Robie House, and his home and studio in Oak Park. I have always told Carol that I thought it would be neat to spend more time in one of his homes than what is possible on a group tour, to really experience the architecture. Carol gave me my wish with a 2-night stay at the Arnold Jackson House in Beaver Dam, Wisconsin, a converted Bed & Breakfast designed by Frank Lloyd Wright. Along the way on the weekend trip was a planned tour of the Muirhead Farmhouse in Hampshire, Illinois, and the Laurent House in Rockford, Illinois. It was going to be a Frank Lloyd Wright weekend bonanza! The trip was scheduled for May 19 through May 22. We set off first for downtown Chicago for the first night’s leg of the trip. We stayed in the Mile North Hotel on E. Superior Street, just east of the Magnificent Mile. Once checked in, we walked around the streets of Chicago. It was a beautiful late afternoon, and we found ourselves landing at Ditka’s, a famous restaurant and watering hole, just a few blocks from our hotel. We sat outside and had a drink under the trellis out front. While googling places we could go next, we found that we were just a few blocks from the Chicago office of Cordogan Clark. We decided to “pop in” to see the offices for the first time. We were greeted by John Clark and several of the Chicago staff, given a quick tour, and went next door to Prosecco’s, an outdoor café for drinks, calamari, and great conversations. It was a very special surprise! John and the staff were great! Unfortunately, after a short break, they had to go back to work! 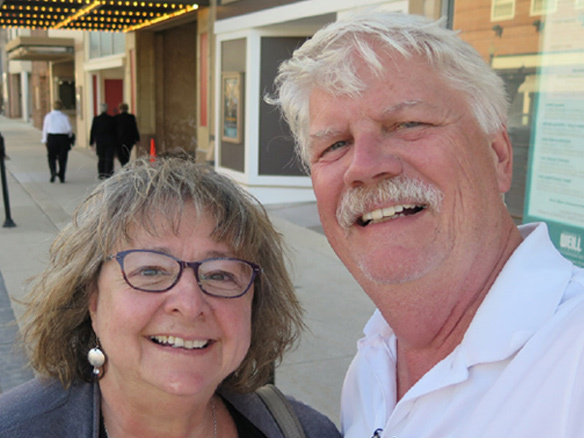 Carol and I walked around the downtown some more, seeing the sites and great buildings that Chicago has to offer, and retired to our hotel later in the evening, anxious to head off to our first Frank Lloyd Wright experience the next day. Friday morning, we headed off to the Muirhead Farmhouse in Hampshire, Illinois, originally built in the early 50’s. We arrived on time and were greeted by Gary, the owner of Muirhead, and our host for the next 2 hours. Carol had arranged for a private tour, and Gary did not disappoint! For the next 2 hours, Gary showed us all the rooms of the house and told stories about how the house had been left neglected for some years and the many restoration projects he himself had undertaken to restore the house to its original design. The stories were incredible. Most rooms were gutted down to the original studs and rebuilt with care back to the original design following the Wright drawings exactly. Gary salvaged as much of the original materials as possible along the way to make certain the restoration was authentic. Some improvements were made. Gary showed us one of the original recessed light fixtures installed as part of the original design. They were a one-of-a-kind design by Wright. Unfortunately, when Gary opened up the ceilings in some rooms, there was evidence of actual charring of the ceiling joists due to the excessive heat that was trapped by the custom light fixtures. Gary came up with a unique solution to provide a similar look of the original, but with a UL listed light that was available on today’s market. As Gary noted, it was a wonder the house had not burnt to the ground! Gary also took some time to explain settlement issues that had caused the entire floor of the children’s wing to settle, enough so that the entire floor had to be removed and repoured as new concrete. Gary worked hard to replace the in-floor radiant heating system, the 4’ by 4’ scored concrete pattern, and the typical Cherokee Red floor color. Each floor square was poured individually and the red tint applied, just as it was done back in the early 50’s when the home was originally built. Since the rooms of the children’s wing all had to be completely rebuilt, Gary took the liberty to include more bathroom space to accommodate his growing family. However, Gary was steadfast to denote which walls were original and which he added. Gary has been a great steward of this beautiful example of a Wright Usonian house. Our next stop was to our home for the next 2 days, the Arnold Jackson House in Beaver Dam, Wisconsin. We arrived in the late afternoon and were greeted by Elizabeth and Kathy, our hostesses for the next 2 days. Our room was the Lorna Room, a small but comfortable bedroom on the main floor with ribbon windows along one wall offering great views out to the landscaped yard,our room had private bathroom next door. We met another couple that were staying in the Master Bedroom and were entertained in the living room by stories of the history of the house by Elizabeth, the current owner. The Arnold Jackson House was originally built as a pre-fab home in Madison, Wisconsin, and later relocated to Beaver Dam in 1985 to its current site. It is a 2-story with a walk out lower level, set into the side of a hill. It has many similar details to the Muirhead Farmhouse that we had visited earlier. It became obvious that Wright was perfecting his design theme within the detailing of these homes, making subtle revisions to enhance each next home he designed. It was pretty awesome to stay in a house designed by Wright. The home was airy and bright in most areas due to the extensive use of large windows. Ceilings in the main living room and dining areas were high and allowed the reflected sunlight to dance on the ceiling during the day. The woodwork was simple but very modular and well detailed, a trait of a Wright home. There was always an interesting view out the various windows. The large cantilevered fireplace was a centerpiece to the living room, and although it was warm outside, the fire was lit both nights to honor the man who designed it. It radiated a warmth that added to the many conversations with our hostess and the other guests of the home while we were there. Frank Lloyd Wright books were scattered across the many horizontal surfaces of the rooms, and it was easy to become immersed in the history of the house and the life of Wright. It was special to get an opportunity to read a book about the works of Wright, while sitting in a home designed by him. After spending 2 days at the Arnold Jackson House in Beaver Dam and exploring the small towns around there, it was time to head home. But our Frank Lloyd Wright adventure was not over yet! Our next stop was the Laurent House in Rockford, Illinois. This house was the only house that Wright designed specifically for a disabled person and was also noted as one of his personal favorites. I wanted to see it. Carol and I were part of a small group tour of the Laurent House, about 8 visitors, and 2 guides. Our guides explained the history of the house that was built in 1952 and pointed out the many features that allowed the owner and his wife to maneuver around it easily, long before the ADA laws of our times were thought of. The home featured wider doors, recessed bases for furniture, chairs designed lower than normal so that everyone sat at the same height as a person in a wheelchair, and sinks with clear space under for turning a wheelchair. We saw many features that we expect to see in a modern office building for a person confined in a wheelchair. But these elements were thought of years ago by Wright. Even the window sills were lowered to a height appropriate for a person in a wheelchair to look out. He had thought of everything. Wright later called the Laurent House his “Little Gem” and referred many future clients to visit the home that he loved so much. Unlike many of the homes Wright designed, Wright did visit this house after its completion to enjoy the fruits of his labor. The guides provided several stories of visits from Wright over the years before his death. Once we left the Laurent House, our Frank Lloyd Wright trip was just about over. It was a great weekend, and I learned to appreciate his designs even more. These were some great examples of his work, and I would encourage you to visit them if you can. They are worth the trip. If you can’t visit them, you can still Google them and see wonderful photographs of these homes, inside and outside. I hope you do! Now, for me, I am wondering what I will get next year for Christmas? Maybe a trip to see the Sydney Opera House, my all-time favorite building in the world! Carol, if you are reading this, I am available for that trip to Australia!